Athina Sporting invites you to join us on our South African wing shooting trip for some of the best wild game bird shooting in the world. We host nearly all of our hunts in order to provide both an enjoyable social experience in addition to the excellent sport in the field. This hunt offers wing-shooters the opportunity to shoot a wide variety of African game birds and waterfowl throughout their trip. We often reach twenty species of game birds shot. Additionally you will also have the chance to experience the fantastic pigeon and dove shooting available locally. This is genuine wild bird hunting and so field-craft and hunting knowledge is needed to get the best of these birds. Hunting takes place on a variety of farms and properties over the maize, sunflower and sorghum crops that are the home and food source for the wild game birds. We have over 20 species of game available in south Africa making it a wing shooters paradise. These include the helmeted guinea fowl and francolin, which we either drive to the guns or walk-up over pointers. Many farms also include small water dams that we also drive, so the bag can include several species of duck and geese; including yellow-billed duck and whistling duck. March-Mid-May: This is prime dove and pigeon shooting time as it coincides with the ripening of the sunflower crop. Mid-May-July: We conduct most of our main Mixed bag hunts at this time of year. Game birds can be driven from standing maize crops and there are plenty of doves and some pigeons for afternoon flighting. If you are two people or more we can customise your itinerary to suit your particular interests. Contact us for a full collectors trip, where we visit several locations and take up to 20 species in a 10 day hunt. We consider the South African Rock Pigeon to be one of the most sporting birds in the world. With upland game birds, we usually drive them over the guns using teams of beaters and dogs. 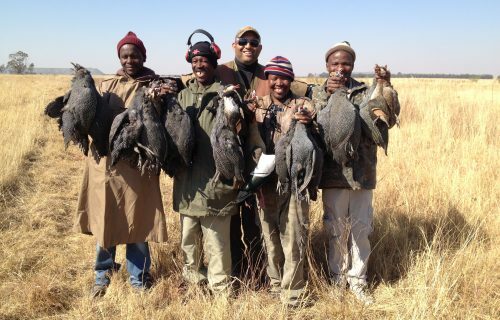 A large flock of guinea fowl bursting over your head is a heart stopping experience for any shooter! Walking up field margins and uncultivated areas with pointing dogs provides some great sport, especially for small groups. The francolin in particular like these undisturbed grassy areas. We spend the afternoons shooting the pigeon and dove flight-lines to and from their food sources. With the Rock Pigeon ranking as one of our most sporting gamebirds anywhere in the world, this is a real treat. Your adventure will be led by our professional hunter with 25 years of experience, who will guide you on a daily basis in the shooting field. Teams on these hunting packages will be accompanied by a bird shooting specialist from Athina Sporting to ensure that all of your needs are met. Accommodation will be in comfortable chalets with single occupancy, and each person will have an en-suite. The hunts are fully catered to include all food and drink, and all transport in South Africa. The Athina Sporting team members are all dedicated ‘foodies’, so much attention is given to the menu. We will prepare the game birds we shoot for cooking as appetisers on the camp braai if desired. It is an Athina Sporting tradition that we spend our evenings round the fire pit, sharing hunting stories with new friends, smoking a good cigar and enjoying a decent single malt (or a fine Kentucky reserve or rare Tequila with our American guests). This is all all inclusive price, with no extras for game shot, transport, food or drinks. The only things you need to pay for on location are your cartridges and tips to staff. The majority of shooting locations are close to our accommodation so as to maximise hunting time in the field. For keen wildfowlers we can offer some excellent duck and goose shooting. Whilst this involves travelling between 45 minutes and 2 hours to specific properties, it is worththe journey. You will have the chance to tackle the mighty spur-wing goose and the Egyptian goose, as well as a number of duck species such as teal and pochard. The water fowl shooting can be so good we recommend allocating one afternoon to this during your week’s hunting, or alternatively we can also plan an overnight stay at a lodge near the wetlands. This will allow for several outings. Our South African wing shooting hunt is flexible to allow hunters time for some plainsgame hunting, or additional days for sightseeing or fishing. Contact us today to register your interest or book your own wing shooting trip.